"Look up. Look down. Look all around." Think you know a lot about Carmel? After a walk with Gael Gallagher, you'll know a whole lot more. A transplanted Bostonian, she has been leading tours on the Monterey Peninsula since 1984. 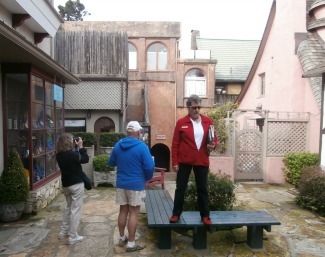 Tuesdays through Saturdays she meets with visitors in the courtyard of the Pine Inn before leading them on a two-hour tour of Carmel-by-the-Sea. It's beautiful here. Anybody can see that. But even a frequent visitor will appreciate the area so much more after getting the stories and back stories from Gallagher. Part historical, part architectural, her tour also finds time to discuss the artists and celebrities drawn to the area over the years. The tour is a good stretch of the legs, too. Ocean Avenue is Carmel's main street. It is avoided when my small group of travel writers accompanies Gael Gallagher on a typical walk through town. Nothing wrong with Ocean, but visitors will find that on their own, she explains. She'll take us to places we might not have seen otherwise. “Look up. Look down. Look all around you,” she tells us. Sometimes she has a story about some little thing we mightn't have noticed. Sometimes not. Maybe there is no story associated with some of what we're seeing, but we writers are having a richer experience after we take our blinders off. We find that the Pine Inn, from whose courtyard we embark, was once called the Carmelo Hotel. In itself, this fact is not so surprising, as hotels often change names with different ownerships. However, the Carmelo was located at the corner of Ocean and the street that is now Junipero. Partially dismantled, the main building was rolled on pine logs down the dirt road that was Ocean Ave in 1906 to the corner of Monte Verde. There it became a part of the Pine Inn, several blocks to the west of its original location. We learn that early residents opted to have all mail deliveries go to the Post Office, rather than to individual addresses. In fact, there really are no street addresses, at least not with traditional numbers. A business or residence, for instance, might be identified as being “on Seventh between Dolores and Lincoln,” sometimes with additional help such as “third house from the corner.” It's a literate little city, too. Over 3,000 of the 3,722 residents possess a library card. They read, but they also visit with their neighbors at the library, too. This sounds much more appealing than meeting your friends at a Starbuck's in the mall (There are no Starbucks or other chains outlets here, by the way, though there are plenty of spots to get a cup of coffee). There are many art galleries and our tour guide tells that community really does have a history of being a community of artists. There were—and still are—painters, sculptors and writers, too. Jack London and John Steinbeck are just a couple in that latter category who didn't just visit, but lived in the area—at least for a while. We're led into Dawson Cole Fine Art, where we're encouraged to touch the Richard MacDonald sculptures, even spin them around on their swivel bases to appreciate all their angles. Later we visit Lulu's Silk Art Gallery, where we see an exquisite piece of silk embroidered on both sides—apparently, a couple of years work for two artists in China. Currently Clint Eastwood might be the most notable celebrity and Gallagher fills us in on his term as Carmel's Mayor, then walks us by the courtyard of the Hog's Breath Inn, the San Carlos Street restaurant and bar he used to own. 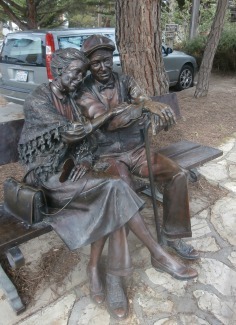 Doris Day lives in retirement in nearby Carmel Valley, but is a part owner of the Cypress Inn at Lincoln and Seventh. Though Vincent van Gogh did not live in Carmel, a connection resides here. A table purported to be the one on which he took his meals when painting in Provence is in Casanova Restaurant at Mission and Fifth, one of the many businesses Gallagher introduces us to. There is so much to see and so many stories to hear. There are times we pause for reflection and maybe an anecdote or two from our leader, but for the most part we are on the go. In two hours time Gael Gallagher relates an amazing amount of Carmel lore. She doesn't lack for energy and generally is in the lead as our little troupe steps briskly from location to location. But it's not just her physical vibrancy that impresses. She has the passion of someone who loves her community and enjoys telling us everything about it. Details about her tours can be found at www.CarmelWalks.com. Editor's note: This is the second in our April series of Carmel articles. 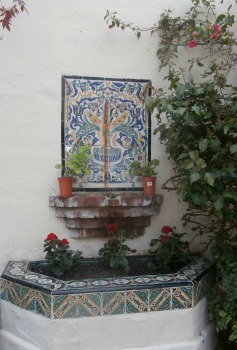 A Visit to Carmel appeared earlier in the month and several other pieces will follow. If you're thinking of visiting the area, you may want to first check out the Monterey County listings in the Central Coast section of Taste California Travel's Resource Directory. There you will find links to the websites of hundreds of Lodging and Dining options, as well as links to websites of area wineries and craft beer specialists.